Here in Georgia the temps have begun to dip at night making it possible to open our windows at night. I love this time of year for many reasons and not so much for other reasons. The leaves are starting to change and the sun sinks low earlier. For me Autumn is beautiful and exciting. It means Christmas is right around the corner, YIKES! It’s time to bring out the sweaters. It won’t be long before we start having fires in the fireplace, which gets me all mushy thinking about hot chocolate and really good books. I love to curl up in front of the fire with a good book or better yet with my laptop working on my latest manuscript. Some days when the air is crisp I’ll walk out to the front porch swing with a thick sweater and hot chocolate to write. Oh and don’t forget the pumpkin spice flavored everything. My coffee in the morning is filled with pumpkin spice creamer and visions of pumpkin spice doughnuts dance in my head. It’s best they stay in my head and not on my hips. Although I have ventured there some already. But there’s always a down side to the changing of the seasons, my allergies. Yep, I’ve been a little out of sorts for a couple of days and yesterday it hit. Woke up last night to puffy cheeks and intense pressure. Sleep wouldn’t come so I walked into the den and sat reading a great book for a couple of hours. But it happens every year so I’ll medicate myself and drink plenty of warm drinks to help with the stuffy head. The biggest problem is I want to write, but pounding heads and writing don’t mix, unfortunately. I’ll have to do some heavy writing when this spell is over with, but that’s what we writers do best. We marathon write as deadlines loom over our heads. Sometimes my best writing is when I’m pushed in a corner and time is running out. But for now I’ll leave you with something to think about. My new series “5 Oaks Ranch” is coming soon. 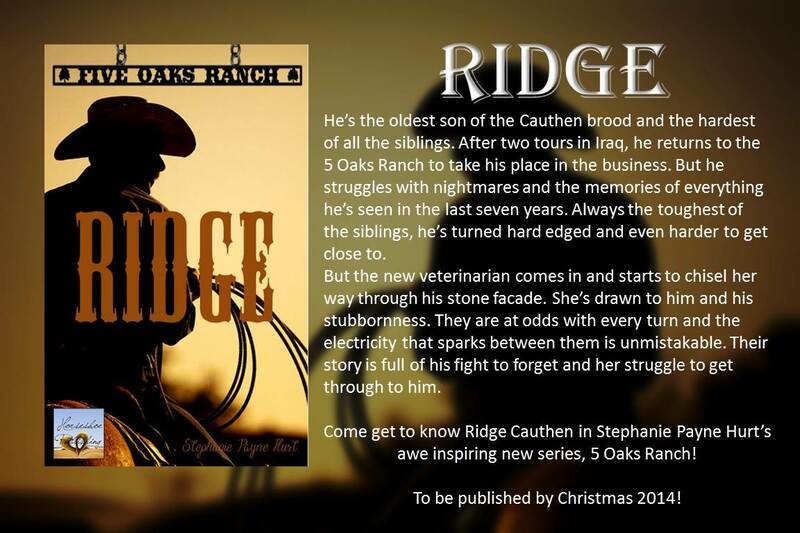 It will start with Ridge, the oldest sibling. Categories: Uncategorized | Tags: Allergies, Autumn, cowboy romance, Fall, fun, Pumpkin Spice, seasons, Westerns, Writers, Writing | Permalink. Autumn is my favorite time of year too. Wow! Where has the year gone. Thanks for making me hungry for doughnuts…but love the warm fires and curling up with a good book. So you can imagine I can’t wait for your new series. I’ve already stocked up on Pumpkin Spice creamer. This year has flown by. I’ll be posting several update regarding the release date of Ridge. I’m excited about this new series.